“Form follows function” is a famous axiom coined by revered architect—and mentor to Frank Lloyd Wright—Louis Sullivan. Wright later expanded upon his teacher’s thought to “form and function are one.” These design philosophies are embraced in various manners in our society, including running shoe design. Runners have an array of fashionable options for their footwear, but, at the end of day, it is important that they give greater attention to function, which includes choosing pairs that fit well and help to avoid black toenails. Now, there are various ways to decrease the risk of black toenails, but one that makes a lot of sense is ensuring that you have a proper running shoe fit. Darkened nails are often (but not always) an indication that the soft tissue underneath has become bruised or blood has pooled between the nail and the nailbed. This can result from repeated physical trauma, like when a toe keeps hitting the front of a shoe on a long run. How your running shoes fit can play a role in helping you avoid black toenails. When you purchase a new pair, make sure that your heels are cradled snuggly. This will assist in making sure that your feet don’t slide forward in the shoes, which will also help decrease your risk of developing blisters. In the front, there should be about a thumb’s width between your longest toes and the front of the running shoes. Also, your toes should be able to wiggle. If they are cramped together it’s a sign that you need another pair. Our hope here at Dallas Podiatry Works is that you are able to avoid having to deal with a case of black toenails in the first place. 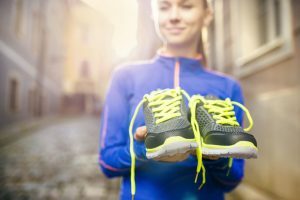 Running shoes that fit properly can certainly help with that, but know that we are here to help if you find yourself with a darkened toenail. The experts at our practice will assess the situation and provide a diagnosis so you can understand the condition. Then we will create a treatment plan so you receive the care you need. We have offices conveniently located in Dallas and Plano, TX and you can schedule your appointment at either one today through our online form or by calling toll-free 972.566.7474.